The QCM922A is the successor of the market-leading QCM922. 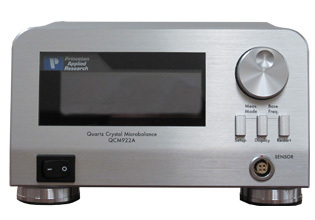 The new QCM922A platform adds many key features which provide researchers the capability to determine a small mass change by measuring resonance frequency, while simultaneously determining viscoelastic change by measuring resonance resistance. The QCM922A's extended bandwidth allows for high sensitivity, up to 30MHz, as well as high-speed data acquisition, up to 100 data points per second. A small footprint, light weight and USB 2.0 communication make for easy setup anywhere in the lab. Front Panel: The QCM922A has a 4-line OLED front panel display capable of simultaneously displaying Frequency, Resistance, Base Frequency and Gate Time. There is also a setup menu that allows the user to configure the system independent of any control software and to view the real-time data on the display. Analog Outputs: In addition to the actual measured data appearing on the front panel, there are two analog channels on the rear panel that provide an analog voltage output that correlates with the resonant resistance and the frequency values. The data from these outputs can be collected with the Auxiliary Inputs of the Princeton Applied Research potentiostat and its supporting software, simultaneously with the potential, current, or charge values when performing EQCM experiments. Computer Interface: Plug-and-play USB 2.0 communication. WinQCM and QCMAdm Software: Potentiostats with external analog outputs for potential and current can be connected to the QCM922A via the Analog Inputs, allowing data to be acquired in the optional WinQCM software. Optional QCMAdm Software can be used to measure the frequency response characteristics of the resonator.